At the age of 34, at the height of the American Civil War, Daniel volunteered to fight to preserve the union. Daniel joined the 17th Connecticut Volunteer Infantry as a Private in an infantry regiment that served in the Union Army during the American Civil War. Daniel registered for the 17th at the nearby town of Bridgeport on August 13, 1862. He was assigned to Company G and marched out towards the front lines, on August 28, 1862, under the command of Colonel William H. Noble. Daniel was 5’5 and 1/2, had fair skin, brown eyes, and brown hair. A man named William Dove, possibly a relative, mustered out with him. Among the many men of the 17th were relatives of his wife, Ruth. Daniel left behind in Connecticut five children to be raised alone by his wife, Ruth, who in his absence must have catered to their children’s education. In addition to leaving behind a young wife, Daniel left at home two-year-old Anna Bell (1860-), three-year-old Ida (1857-), six-year old John Willet(1854-1934), Mabel’s father, eight-year-old Cyrus Griffen (1852-1916), and nine-year Irving Berlin (1851-1911). Daniel and Ruth had lost twin boys at birth a few years earlier and no doubt the separation from her husband must have been particularly difficult for her. Whatever the character of the man in August of 1862, what Daniel was to experience in the American Civil War would no doubt change him forever. According to military report of the Adjutant General’s Office of the War Department dated October 28, 1886, Daniel would have an eventful yet traumatic military service. On May 2, 1863 at the Battle of Chancellorsville, Virginia, Daniel was captured and sent to Libby Prison in Richmond, Virginia. Libby Prison was a Confederate prison at Richmond, Virginia, during the American Civil War. Libby Prison gained an infamous reputation for the overcrowded and harsh conditions under which officer prisoners from the Union Army were kept. Daniel would have been exposed to prisoners who suffered from disease, malnutrition and a high mortality rate. By mid-1863, when Daniel arrived at the prison, one thousand prisoners were crowded into large open rooms on two floors, with open, barred windows leaving them exposed to weather and temperature extremes. From Libby Prison, Daniel was sent to numerous parole camps. The parole camps, for the most part, were a result of parole system where captured soldiers pledged not to fight. In the days of formal warfare, it was customary to exchange prisoners of war by a complex formula of numbers and relative rank. Often, to avoid being burdened with large parties of prisoners, forces in the field would “parole” them; that is, release them to go home on oath not to perform any military service until exchanged. Early in the Civil War, it was discovered that many paroled men would disappear into the civilian population, not to be found when ready for exchange. So keeping them under military control until exchanged and returned to their units became imperative. It was in one of these parole camps which Daniel G. Dove found himself presumably waiting to be restored to a combat role if some prisoners of war were traded to the other side. These parole camps often had harsh conditions. Respectfully returned to the Commissioner of Pensions Daniel G. Dove, a Private of Company G, 17th Regiment Connecticut Infantry Volunteers, was enrolled on the 13th day of August, 1862, at Ridgefield for 3 years and is reported on the muster rolls of Connecticut from August 28, 1862 (date of muster in), is April 30, 1863 present; May and June 1863 absent paroled prisoner; same is August 31, 1863; September & October, 1863 present; same is February 29, 1863; March & April 1864 absent; no remark. Regiment reports for March 1864, reports him absent in [intelligible]. . . . on daily duty [intelligible]. Roll for May and June 64’ present; same to June 30, 1865. Mustered out a Corporal with Co. at Hilton-Head, SC July 19, 1865. Company morning reports show him June 4, 1863 gained from missing in action, Oct 21, 1863 returned from Parole Camp to regiment. Company release for July 1863 shows him as absent, wounded and paroled; so borne on return for August & September 1863. Regimental hospital records show him admitted November 4, 1863 with diarrhea and excused Dec. 30, 1863. The records of this office furnish no evidence of alleged disabilities. 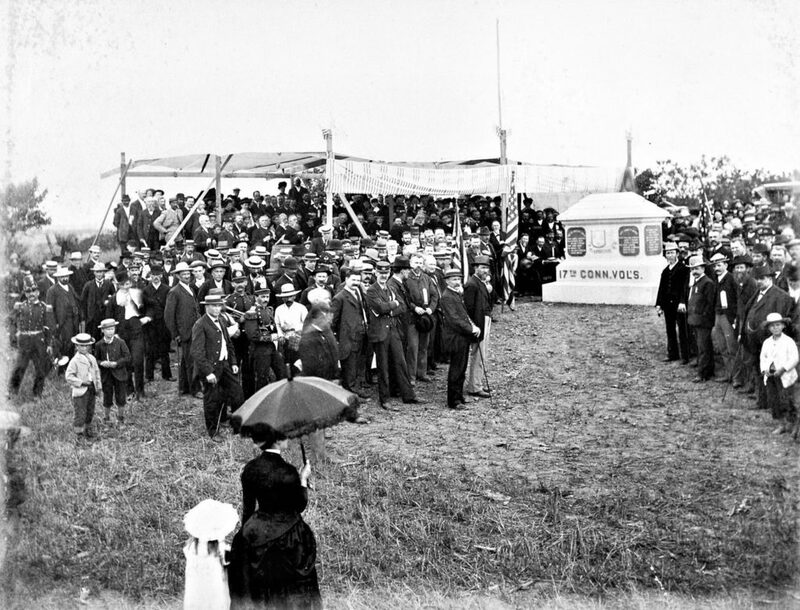 Gettysburg photographer William Tipton shot this image of the dedication of the 17th Connecticut monument on July 1, 1884. In July 1863, the 17th Connecticut began its campaign at Gettysburg, Pennsylvania in what would be the defining battle not only of the unit but the civil war. Others captured simultaneously with Daniel at Chancellorsville were released in time to rejoin the unit at Gettysburg. It isn’t clear from the record whether Daniel fought at Gettysburg, or was alternatively sitting in a Confederate prison, and the issue needs further research. Whether at Gettysburg, or in a prison, the experience must have been exceptionally difficult for Daniel and he must have been a witness to many horrible sites. The confusion of the record regarding whether Daniel had deserted his unit during the summer of 1863 no doubt must have caused Daniel much anxiety. It must have taken some efforts to set the record straight. Daniel’s station and condition appears to have improved as the war went on, he being honorably discharged at the rank of Corporal in July 1865. 1870, with his family, [Daniel and Ruth] came to Michigan, choosing Cedar Springs for their home, where he has resided since. [Daniel] followed draying [a dray is a low cart without fixed sides, used for carrying heavy loads] as a business for many years. Until later in life he retired from active business. Mr. Dove was converted under the preaching of Rev. J. Malcomb Smith of the Congregational society and was a member as long the society remained and was a much-respected citizen, quiet and loving in all his dealing with his fellow man. A high standard of character to leave to his bereaved family and friends. . . .Rev. Carrick gave a very appropriate discourse to a large number of sympathizing friends. Internment in the family lot in Elmwood Cemetery. The family feels very grateful to neighbors and friends for the many acts of kindness shown them in their sad bereavement, and also to the Masons for many favors. . . . Many theories have been put forth over the generations about Daniel G. Dove and theories regarding his origins have been ripe with speculation. Catherine Gibbs believed that Daniel had African-American ancestry although DNA results show that theory without any basis. The author posits, without any substance, that Daniel Griffen Dove was not his birth name. A griffen is a mystical flying creature and the perhaps the name was adopted later or that the whole name Griffen Dove in general was adopted by a young man that appears out of nowhere in the historical record in 1850 to marry Ruth Beers. Ruth is a descendant of Daniel Beers (1726-1801), who fought with 2nd Massachusetts Regulars in the American Revolution under John Bailey; Cornelius Dykeman (1707-1783), who was accused of being hostile to the cause of independence during the American Revolution evolution because he criticized the new Continental currency; Daniel Tourner, an original Dutch settler of Harlem, New York; numerous founding settlers of both Hartford, and Norwalk, Connecticut, including Ralph Keeler (1613 –1672), an ancestor of many prominent individuals in American history. There is some discrepancy as to whether John Willet was born in 1850 or 1854. Daniel Dove’s civil war application lists Solon W.’s birthday as December 9, 1854, which would make Solon the middle. However, other records place the date as 1850 which would make Solon W. the eldest child. Perhaps just one that died either during or within two weeks of childbirth.